Prices are subject to change based on availability and qualification of applicant, additional fees may apply, OAC. Supplies are limited. Pricing only available on specific advertising unit and subject to the applicant’s qualification and OAC. Hillside Terrace Apartments offers four unique floor plans in Lemon Grove, CA. Apartments range from 616 to 924 square feet. Interior spaces are intentionally designed with practical and upscale features. 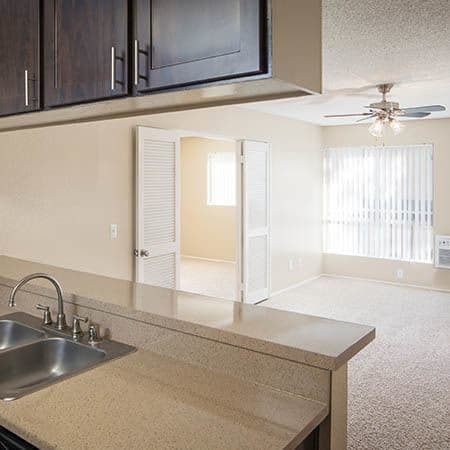 Open floor plans, large bedrooms, and fully equipped kitchens with breakfast bar come standard in every unit. From a spacious one bedroom, one bathroom unit to an efficient dual master home, we have something for everyone. 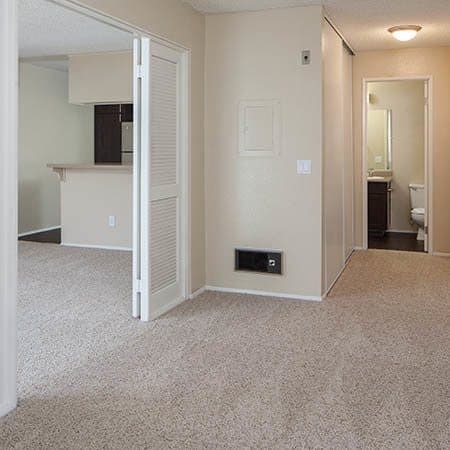 Those in need of a cozy space will love our roomy one bedroom apartments. At 616 square feet, there is plenty of room for your furniture and belongings. One bedroom apartments include two closets and a large bathroom. Select your ideal two bedroom apartment home from three different floor plans, ranging from 797 to 924 square feet. These homes include one or two bathrooms, hall closets, fireplace, and large living area. The largest two bedroom homes feature dual master suites and are perfect for roommates, families, and everyone in between. Open floor plans are only the beginning. Each of our homes also include stylish designer upgrades and finishes. Discover what makes Hillside Terrace Apartments a unique rental experience in San Diego County. View our floor plans and then call us to schedule a tour of your favorite floor plans.